Scientists may have rediscovered a long-lost recipe from Earth's primordial cookbook for life, one that takes chemical ingredients that were available in the oceans of Earth's youth, adds heat, and churns out the organic molecular building blocks of life. This is not only an important step in the journey toward solving the puzzle of how and where life originated on Earth, it also offers guidance for narrowing the search for life on other worlds — where to search and what to look for. What's Cookin' in NASA's Kitchen? NASA astrobiologist Laurie Barge and team, at the Jet Propulsion Laboratory in Pasadena, California, set out to demonstrate how organic molecules might have formed 4 billion years ago, in the pitch darkness on Earth's deep-ocean floor surrounding vents of hot, chemical-laden water spouting from Earth's interior. Called hydrothermal vents, these deep-sea "hot springs" of chemicals and heat exist today, and all but certainly existed eons ago before life began. To accomplish their goal, Barge and team recreated in their lab the conditions that prevailed around hydrothermal vents in Earth's primordial ocean. They prepared a mixture of water, minerals and other chemicals that would have been present in ocean water on the young Earth, removing oxygen from the mix to account for the fact that little of that element existed in the ocean or atmosphere in Earth's pre-life era. Then, heating the water to 158 degrees Fahrenheit (the water temperature surrounding a hydrotherapy vent), they injected a water solution that included small amounts of oxygen and other minerals, to simulate a hydrothermal vent. The mixing of the simulated primordial fluids produced chemical reactions, out of which formed alanine, an amino acid, and alpha hydroxy acid. Amino acids are the building blocks of proteins, which in turn make up all living things. A tasty result to say the least! Before their very eyes the experimenters witnessed the genesis of molecules all-important to the formation of life. And since they had been careful to recreate the natural conditions that existed on the primordial Earth, it was not just the result of a contrived chemistry experiment, but a re-enactment of nature's own original cookery. 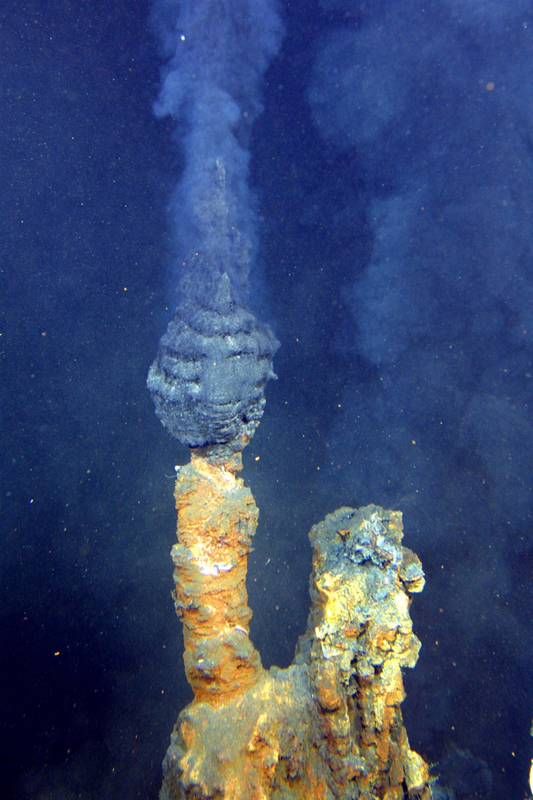 Today we find communities of advanced life forms thriving around hydrothermal vents. 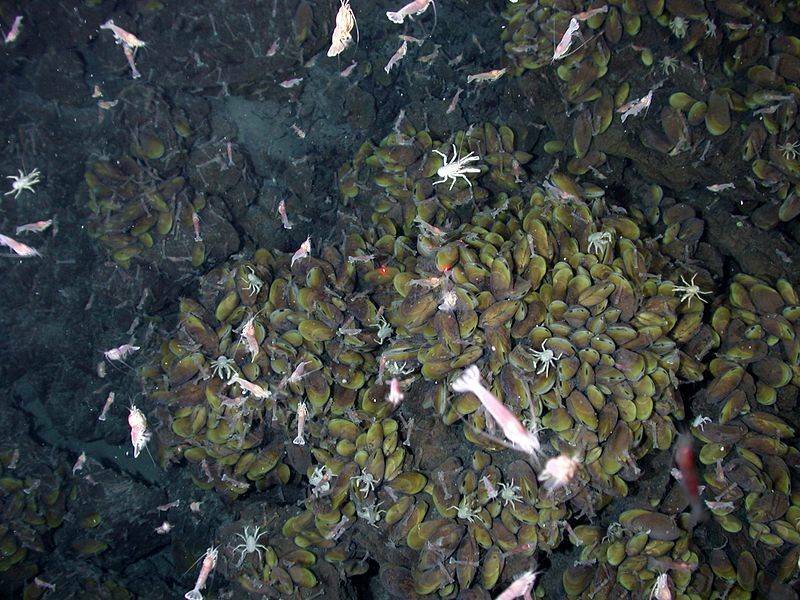 Fish, crustaceans, cephalopods and many more species teem around these geothermal oases on the cold, dark ocean floor, their ecosystems sustained entirely by the chemical bounty of the Earth — no sunlight required. It is probable that the ancestors of these complex organisms originated from the sunlit ocean world above and migrated to hydrothermal vents some time in the past, there to adapt to the very different environment. But the question remains: Where did the first, single-celled living organisms appear on Earth? In a sunlit tidepool, where organic molecules were sloshed together by waves? Or, did the first microbe spring forth from the dark warmth of a hydrothermal vent, from an original recipe cooked up wholly by the Earth? 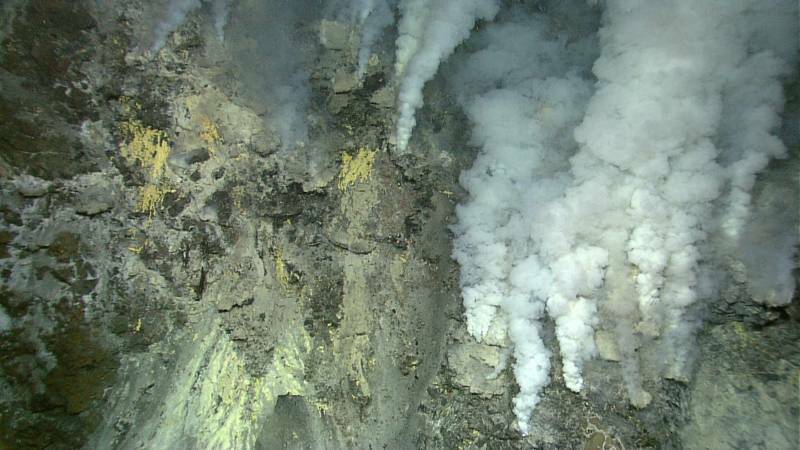 Understanding how organic compounds like amino acids might have originated around hydrothermal vents on Earth has powerful implications for our search for extraterrestrial life. If we find signs of life on a planet like Mars, past or present, we will be pressed to answer questions about its origin similar to the question of how Earth life originated. Mars once had seas, which may have had some form of hydrothermal vent spouting away on the sea floor. But the young Mars also had an atmosphere, a warm and watery surface environment, a water cycle, and other attributes similar to Earth. And, that life-friendly environment dried up a long time ago, so we might hope to find only the residues of past living things — or at best something still living deep under Mars' surface. But farther out from the sun we have detected oceans on at least two or three moons of gas giant planets, such as Jupiter's Europa and Saturn's Enceladus. Neither of these moons has an atmosphere to speak of, and their surfaces are crusts of frigid ice exposed to the vacuum and radiation of space — not promising environments to search for life as we know it. Under those icy crusts, though, are oceans of liquid water. Water vapor plumes erupting from cracks in Enceladus' surface carry traces of chemicals like ammonia, one of the "precursor" chemicals for the formation of organic molecules. 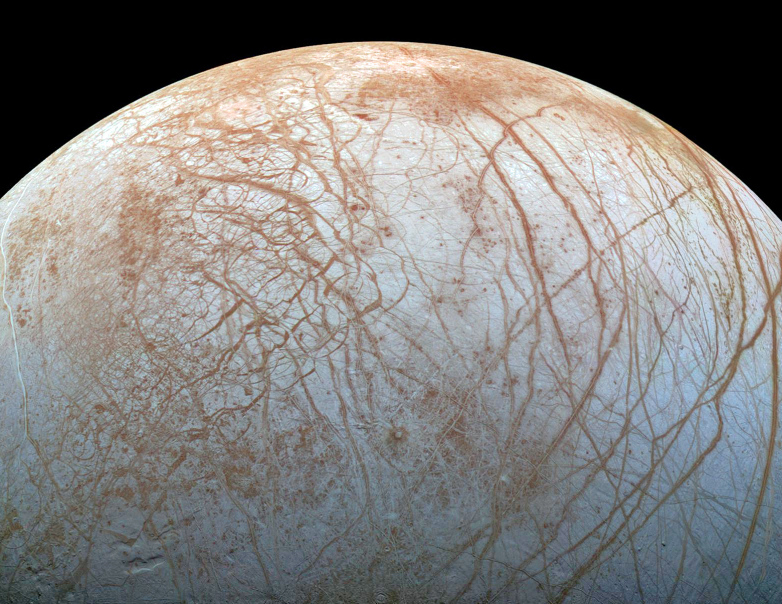 Europa's ocean is global, may be up to 100 miles deep and has twice the water of Earth's ocean. If the ocean floors of either of these moons sport hydrothermal vents, then there may be environments down there similar to those surrounding Earth's vents. We know that the hydrothermal vents on Earth support thriving communities of life, and from the laboratory recipe cooked up by Dr. Barge and team we know that such an environment can easily produce organic compounds, the precursor molecules of life. Understanding the genesis of life on Earth would also focus our search for signs of life on extrasolar planets. 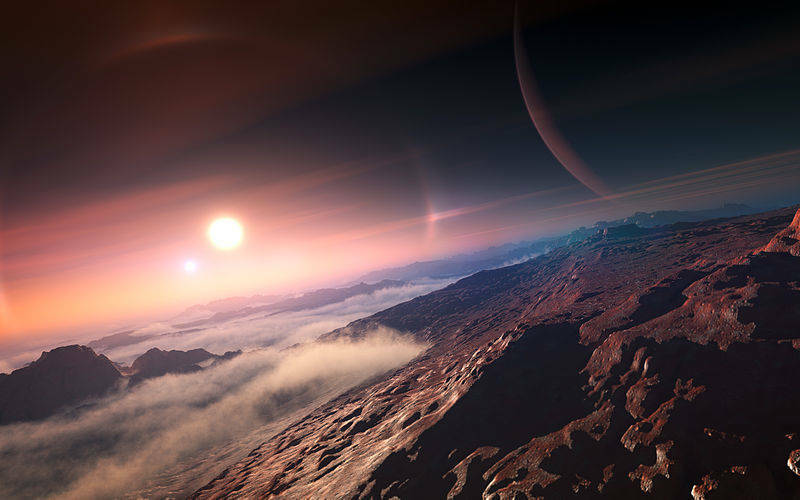 No spacecraft will be reaching exoplanets in our lifetimes (or those of our great great great grandchildren in all probability), but knowing what chemical telltales might indicate the presence of life would be a powerful tool for exploring life beyond our solar system — in nearby star systems, in distant reaches across the Milky Way galaxy, and possibly even other galaxies. I'd say that's a lot of potential from a small bottle of hot mineral water bubbling away in a lab.